The 24 hour shift was a typical one for this time of year. I commute into work on my bike. I ride my bike 2 hours into work for some training and also ride back 2-3 hours after work. It’s a time to get some hard training in on the road for racing season, and also a time to mentally and physically relieve stress of the job. We had a call at 1:30am this morning and got cancelled on our arrival. The patient was already loaded up in the ambulance. It’s easy to stay somewhat asleep in the back after 20 years of working 24 hour shifts. 16 years as a Firefighter/Paramedic with Oakland Fire and 4 years as an EMT with a private ambulance company. This call came in at 6:30 am. The lights go on and the tones sound. We sleep separate from our company officer. He is on the other side of the firehouse. If the call is for a fire, he hits a long bell signaling to us that we are getting dispatched for a structure fire. In Oakland, we can usually hear the 911 call come over the loud speaker for fires but that wasn’t the case this morning. Getting woken out of a dead sleep for a fire is about one of the most adrenaline pumping calls a firefighter will actually physically and mentally feel. It’s like you just drank 4 shots of espresso from Peet’s Coffee. You have no time to think, just react. No time to go use the bathroom first either! I hear the address over the house speakers and we are first due. The address is about 1 minute from our firehouse. We practice putting on our air tanks in that time, but that doesn’t include getting fully encapsulated into all of our fire gear. I look out in the direction of the street to look for any smoke. It was that time of morning where the fog was covering the hills. This inversion layer usually means we won’t see any smoke until we turn onto the street. If it’s a true house fire the street will look like someone laid out some smoke grenades. This makes the task even tougher to give incoming units a scene size up, and report on conditions of the fire. We pull up in front of a house where people are frantically waving and pointing to the back of a 2 story home. In my experience this means there’s probably a working fire on scene. Someone also had a fire extinguisher in their hands. This is when the locomotive I was on came to a sudden halt, and needed to be reversed! We are then told by several people that no there isn’t a fire, but someone hung themselves in the back house. My other firefighter that rides in back with me signals to me to bring the medical backpack and that it’s for a hanging. What? Huh? At this same time our radios are reporting that they are getting calls for a medical at the address and there is no fire. Our dispatch cancels us from the fire incident, and initiates a medical 9E1 MPDS call for a hanging victim. By this time neighbors are hearing the multiple fire engines, trucks and battalion chief coming with lights and sirens to the call. While fully dressed for a fire, I grabbed the medical gear and followed the neighbors to the back house where my officer and other firefighter were already. We now also needed a response from Oakland Police because we were at a crime scene. It took my Company Officer a few moments to get everyone to stop moving pots and plants for us. They were disrupting a crime scene. I found a 62/M prone in the doorway of a back house. Lots of people were around and two of them at the doorway holding onto the patient. One was a female inside with the patient and the other was outside trying to explain to me what had happened. We found a large knife next to the patient, bottle of beer, and something that was hanging from above the doorway. One of my firefighters was already trying to get inside up to the patients head. I took a quick look at the patient expecting to see him already deceased. Usually when we get a suicide by hanging at 6:30 am they have been deceased for a while. Not the case with this patient. Patient had agonal breathing <10 times per minute. He has a fast radial pulse, strong and regular. He is warm and dry to the touch. GCS is 3. His B/P is the following. 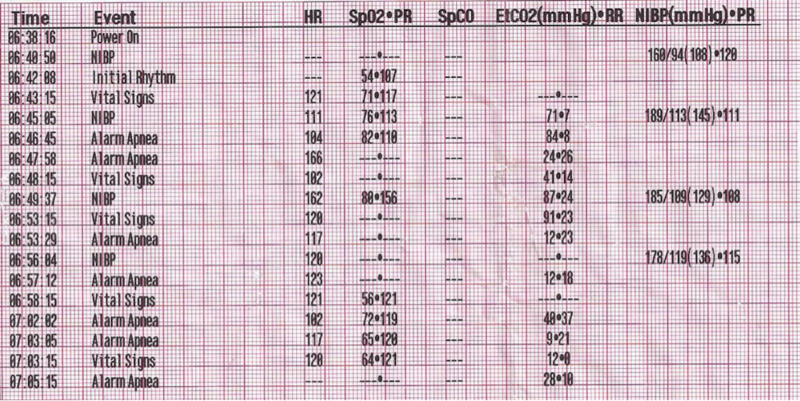 See image of patient vitals throughout. We initiated BVM ventilations to track respirations, and I began hooking up SPO2, CO2, EKG, and BP. Ventilations via BVM were reported to me as successful. Our initial SPO2 was reading <50%. After a few minutes of BVM we brought it back up to 88%. EKG was reading sinus tachycardia. My Engineer went out to the fire engine to get a backboard and c-collar for patient extrication to gurney and ambulance. We attempted OPA and there was too much edema in airway and laryngeal to get it in. Patient respirations decreased, HR increased, and BP elevated when we attempted it. We aborted any more attempts to maintain airway with adjuncts. We attempted c-collar but neck was too swollen by this point and we were unable to maintain a good airway anymore with BVM. We aborted C-Collar and instead placed patient on backboard and used head bed to secure patients head and body for extrication. Enroute to Alameda County Highland ER we attempted a nasal airway and got a lot of resistance and aborted the attempt. We established an IO in left tibia. It was hard to keep the patients CO2 from elevating while keeping his ventilations up enough to increase his SPO2. Highland ER was approx. <5 minutes from our scene. This call was by far the most mentally challenging to overcome, and on my bike ride back home it was all I could think about. The call involves aspects of Fire, EMS, Police, and Hospital. I decided that it would be a good call to share, and write up. This is a really tough call for a few reasons. First it sounds like a pretty emotionally charged scene. Hangings always are. The fact that it was called out as a fire and NOT a hanging makes it even tougher because you can’t mentally prepare for it. There is nothing to do but run with it once you get there. That makes it even harder. From the medical point of view, hangings are usually asphyxiations and as such are run more like medical codes than traumas. Hangings like we see in old west movies are more like traumas because the body falls for some distance first. The body has to fall more than the height of the body to cause a lot of spinal damage. Once that height is fallen, there are usually significant bone and spinal cord injuries. Most deaths usually happen from cerebral hypoxia but usually NOT because of compression of the airway. Some theories suggest the impingement of the blood vessels causes blood backup and decreased perfusion. Whatever the cause, most agree the cerebral hypoxia ultimately is the cause of death. There are often abrasions, lacerations or petechiae near the ligature itself. Our management in EMS will be mostly c spine and airway precautions/adjuncts. Intubation is needed in the patient with respiratory failure and can be challenging as there may also be airway edema. The odd readings of the ETCO2 detector aren’t clear. From a low reading of 9 to a high of 91, I can’t really explain the readings. I propose that the ETCO2 had been building up when ventilation wasn’t happening. Once there was ventilation, then the high readings were registered. Once there were additional full breath/adequate ventilations, the readings were falling as the CO2 left the body. Still, there was a lot of variation which is hard to account for if there was a good seal on the tubing the entire time. In any case, this was a tough call for many reasons. The medical side is confusing, but the immediacy of the response from the EMS crews is also tough. Without time to prepare, the hanging victim requires immediate aggressive interventions (Airway management and C spine precautions) in order to survive. The challenge is that c spine precautions can make maintaining a good airway tough as well. Tough call, and thanks for writing it up for all of us to learn from! Thank you for sharing this challenging EMS response. I haven’t thought about this call in quite some time and your story telling, makes me feel like it happened just this morning. Thanks again for taking the time to put this educational review together and working with Dr Gene Hern, to get his perspective. Looking forward to the next Bay Area Paramedic Journal Club (BAPJC) dinner in April 2016. Wow. Speechless. I felt like I ran this call with you. This must have been tough.